TrimLine Wood Windows and Doors. TrimLine manufactures quality, energy-efficient aluminum-clad wood and all wood windows and patio doors. Choose from casement windows, double-hung windows, bay windows, french doors, sliding doors and more, available with Energy-Star rated Low-E insulated glass for winter and summer comfort and economy. Maintenance-free aluminum-clad exterior is weather resistant and needs no painting. Available in White, Bronze, Earthtone and Beige. Custom colors are also available.Wood parts are produced from the finest quality kiln-dried select Western Pine and are treated with a water repellent preservative. Also available in Oak, Cherry, and Mahogany. Replacement or New Construction Jambs. Double hung and casements are available in either a 3 1/4" replacement jamb for pocket installations, or 4 9/16" full jamb for remodeling and new construction. 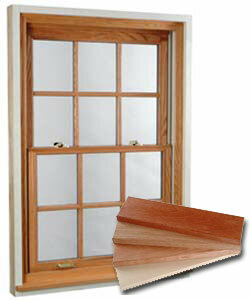 TrimLine windows are manufactured on every 1/8" in width and height for an exact fit. All windows are made with Health Smart Super Spacer, and are available with High Performance Low E glass with Argon fill.